As in my prior guest review for BLT Steak in White Plains, it’s important to start by saying that I am not qualified to properly review a steakhouse – at least not when compared to the Carnivore Connoisseur himself. But with steak, as with art, I know what I like. For context, my favorite steak place is Peter Luger, which has a reputation for being overhyped with respect to the steak (but is appropriately hyped with respect to its atmosphere). Also, it’s important to note that my reviews are often through the lens of a parent dining with children, as is the case here. So certain priorities differ from Johnny Prime’s. Nonetheless, I can use Johnny’s well-conceived ranking system as a structure for my ill-conceived opinions. I wanted steak for my birthday, but a babysitter doubles the price of a steak dinner right off the bat. And a trip into Manhattan with the kids is a suicide mission unless the destination is kid-centric. So my favorite NYC steak joints are just not as convenient as they used to be. I was almost resigned to visiting the local diner for an order of steak and eggs. But then I found brunch at Benjamin Steakhouse in White Plains – owned by the same folks as Manhattan’s Benjamin Steakhouse and Benjamin Prime. Benjamin’s rib eye was great. A nice salty crust and medium rare to my liking. I picked this place because it was close, but also because Benjamin has some genetic history with my beloved Peter Luger, as its owners came from Lugers. 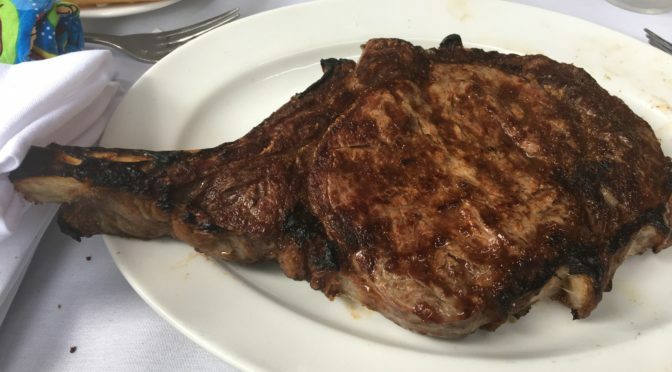 I ordered the rib eye hoping to get plenty of fat and juice, knowing that the NY sirloin or filet minion would be too lean for my tastes (I learned such basics from Johnny’s outstanding Meat 101 and 102). The ribeye was juicy with a nice edge of fat. I would have actually welcomed a thicker strip of fat. I love the fat. When I was a kid, my dad said eating the fat put hair on your chest. Based on the veritable forest I have there, he must have been right. Side note: I have to remember to ask Johnny if it’d be appropriate to ask a steakhouse waiter for a “fattier cut,” or if that’s weird or stupid in some way. Is a big strip of fat technically bad? It is less meat after all. When I go to a BBQ joint, I always ask for burnt ends of the brisket – which are viewed as inferior by some. But the burnt ends are my favorite. I think asking for burnt ends makes you look like you are “in the know,” with BBQ, but without being too big a douche. I wonder if there are any such questions appropriate for the steakhouse with respect to fat. We ended up at Benjamin for brunch, rather than dinner. Fortunately, Benjamin still offered their full menu in addition to a brunch menu. For guys like me, stuck in Westchester with kids, who still want the full steak experience on their birthday, this was a godsend. The menu offered porterhouse (for two, three or four), NY sirloin, filet mignon, and a rib eye. No wagyu. The steaks are “Chef Selected, Dry Aged in Our Own Aging Box” as per the menu. Johnny discussed these cuts in his review of Benjamin Prime better than I ever could. I would have loved a porterhouse. Unfortunately, I am almost always eating steak alone. My wife and kids would rather eat salad and breadsticks. So they can have their birthdays at Olive Garden if they want. 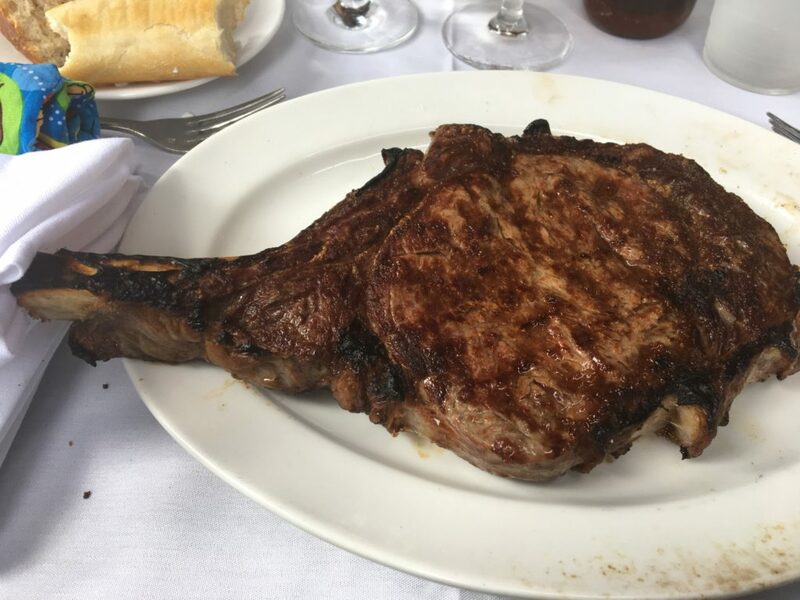 I should have manned-up and just ordered the porterhouse steak for two and eaten it alone ala “John-Candy-in-The-Great-Outdoors.” But my wallet talked me out of it. My ribeye was handed over on a heated dinner plate and I was pleased to see a very generous portion. I had thought perhaps they would send their dinkier cuts up north. Plus, I was there at brunch-time. But this was a nice big steak to satisfy my birthday hunger. I was so relieved when I saw that hunk ‘o meat. My birthday steak quest had ended. And it ended nicely. I do prefer a “sizzling steak presentation,” which I think may be reserved for the porterhouse. Lugers, for instance, delivers your steak already cut, sizzling, dripping with juices and butter; and the plate tipped up slightly so the juices run into a puddle. I know, I know. As Johnny has taught us, that this can result in overcooking and doesn’t allow your steak to rest. I guess I don’t mind sacrificing some taste for a little razzle dazzle, plus I do like steak a little more on the done side anyway. (See, I told you I lack the credentials to review steak). The prices were fair for a high-end steak place, albeit on par with Manhattan prices (which is to say expensive). I thought perhaps the non-Manhattan real estate would bring some savings to me. But, I am sure I am paying an upcharge on steaks imported all the way from Manhattan. Also, steak is probably a “prestige pricing” type of item. A place like Benjamin isn’t looking to compete on price. If anything, it probably wants to match Manhattan prices as to convey a match in quality. I’m not a huge drinker. It was brunch. I was with two kids. Suffice to say I didn’t even see the bar. If I was offered a drink menu, I didn’t notice. I was busy keeping my kids from coloring the cloth napkins and sneezing onto the next table. Since I can’t talk about the bar, I’m going to use this space to describe how great Benjamin brunch was for kids. Make no mistake, Benjamin is not “family friendly,” in the marketing meaning of the term. Benjamin is not “for kids,” in any sense. There was no kids menu. They did not have cups with lids or coloring pages and crayons (we came with our own crayons and paper as per the standard parent eating-out survival kit). Before we left the house, I called Benjamin with a sincere inquiry as to whether bringing kids was okay. Albert (who answered the phone) said it was fine. I clarified that my kids can strain the limits of polite society. Albert again said it was fine. And God bless him, he was clearly sincere in his reassurance, which meant a lot. The waiters at Benjamin were pretty formal and proper; as one would expect from an upscale steakhouse. But even the most uptight waiter smiled sweetly when our kids offered obligatory, parentally-mandated “pleases,” and “thank yous.” I observed another table, with a baby in a high chair, who was keeping busy by dropping his toy on the floor every thirty seconds or so. The table was in the path to the kitchen. Waiters, time after time, without issue, happily picked it up and handed it back to the kid without so much as a mild eye roll or subtle grimace. The food came fast, which is perfect when dining with kids. The check came fast. With the ticking time bomb of children in a restaurant, this is ideal. We did not feel like we were being rushed. 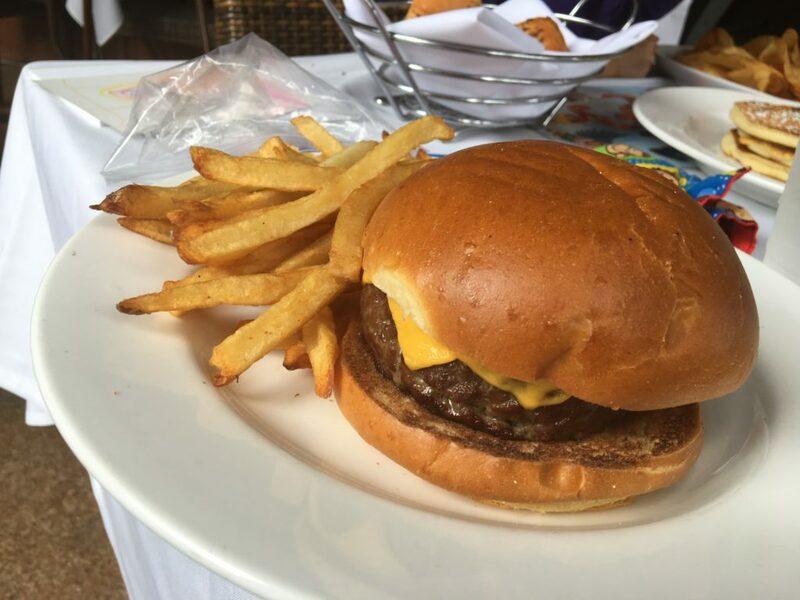 Rather, I think Benjamin boasts an astute service staff who recognizes that a quicker meal pace is needed for a family with young children – as opposed to a romantic date, which should take more time. Towards the end of our dinner Albert came by as my son was writing out his alphabet. Albert kindly chatted us up and made a deal with the kids (after getting our permission). Albert said that if my son got to “Z,” in the alphabet, he’d bring out ice cream sundaes. My son immediately skipped from “G” to “Z.” (True story. He’s his father’s son). We made him finish the whole alphabet, and as promised, two wonderful sundaes appeared, on the house. And truth be told, we got a third, on account of my daughter’s nut allergy (so I got hers when she got her nut free version!). All of this, and we never even told them it was my birthday. Again, this is not a kid’s restaurant. It’s a nice place. So I’m not sure you would want to bring any toddler during primetime dinner hours. But for brunch, Benjamin staff was beyond a class-act for us parents – on edge about bringing their kids to a nice restaurant. Benjamin brunch wasn’t too busy and turned out to be a genius birthday plan. I was able to spend that babysitting money on a good steak, without letting my kids ruin a nice Saturday night out for folks just looking to dine in peace. The brunch menu was pretty brunchy with pancakes, eggs benedict, chicken ceasar salad, a frittata, and not a lot of meat offerings. A burger and thick cut bacon were the most substantial choices. The full menu does not include the burger, but adds rack of lamb and a veal chop, (double thick, extra heavy cut). My wife’s burger, ordered medium, was just okay. Perhaps I expected too much. Burgers aren’t on the regular menu. So if a place is only cooking a few burgers a week for a brunch crowd, it’s not likely to be an outstanding item. Fries – Benjamin’s fries were good. Thick cut, but not steak fries. 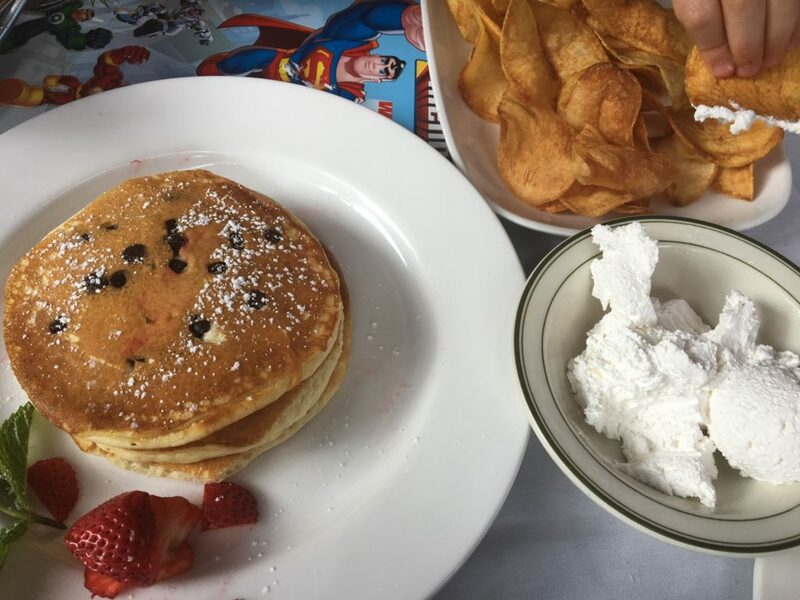 Chocolate chip pancakes – We got these for the kids. They liked them but did note that the dark chocolate chips weren’t their favorite. Naturally, as good parents, we followed up that healthy lunch with some ice cream. Schalg – To my surprise and delight, the kids did not care for the schlag that came alongside the pancakes. Schlag, for the uninitiated, is a whipped topping, pretty much like whipped cream, but not very sweet and perfectly thick – much thicker than your average Cool Whip. 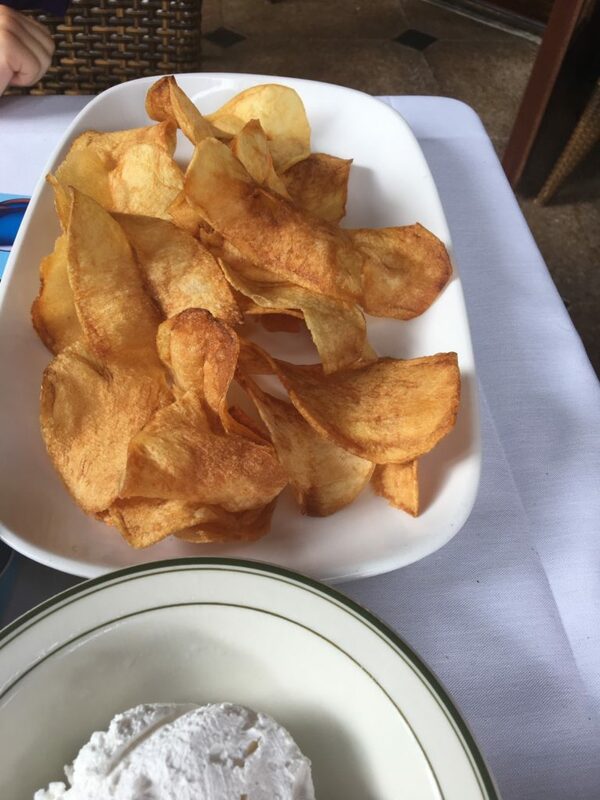 I first got this stuff at Peter Luger and it is my absolute favorite. I ate it alongside my steak as to enjoy fresh. No regrets. To me, a great combination. Ice Cream – Nothing fancy, but pretty much perfect as far as ice cream sundaes go. Fudge, nuts, and a cherry on top. We didn’t try any seafood. Brunch offered a good number of seafood items including tuna tartar, lobster bisque, crabcakes, and oysters on the half shell. The full menu had Chilean sea bass, grilled Norwegian salmon, grilled yellowfin tuna, 3 or 4 lb. jumbo lobster (broiled or steamed), and lobster tails. In addition to the outstanding “kid-centric” service discussed above, Benjamin service was top-notch all around. The waiters were proper and distinguished, keeping the service mostly as an official, arms-length affair. Not unfriendly at all. Just appropriately formal. They entertained my wife’s questions, substitutions, and indecisiveness without flinching. Meanwhile, Albert roamed the floor gregariously, making sure everyone was happy. The food was delivered in a flurry by at least three or four well trained servers. When we got to Benjamin, I had my doubts about Albert’s assurance that it was cool to bring little kids. By all appearance, it’s a place for grown-ups who are looking for a nice quiet, classy meal. White tablecloths. Black bow tied waiters. Big leather-bound menus. Darkly lit. It’s a nice place with all the ambiance of a classically nice steakhouse. Meanwhile, my children can turn Tasmanian Devil in an instant. Strategically, we decided to sit outside. There was no waterfront table or rooftop view. But my kids could be a little squirmier without worrying about upsetting the normal folk.